An effort to bring a form of medical marijuana to Georgia spearheaded by State Rep. Allen Peake continues to move forward, but hurdles remain as lawmakers begin drafting legislation to introduce next year. It is an unfortunate reality that some families across the nation continue to sit and hope for a solution to obtaining a medicine that is currently illegal in their state. In Nebraska, residents continue to fight for the ability to legally obtain CBD oil; however, they are now properly armed with numerous studies released regularly that demonstrate that CBD can help those suffering from devastating seizures, epilepsy, and other debilitating illnesses. Last Friday, Nebraska residents came out to tell their personal stories in front of lawmakers, bringing with them a wide range of powerful emotions and insight into what it’s like living without access to cannabidiol. Jennifer Anton’s brother has been suffering from seizures for 37 years. “We don’t want to go to prison for going to Colorado and bringing back medicine to help him with. We’re just here to show support and pray to God that something will help us, help my family, help my brother through all of this.” Anton says. He’s been on many different medications, but nothing seems to work. Suffering from migraines every single day. “We just feel desperate for help. He’s busted open his head more times than I can even imagine.” Anton adds. State Senator Sue Crawford first heard about CBD oil from a family in her district, who’s son has intractable epilepsy. They had learned about other children who had used CBD in another state, and it had worked for them. After doing some research and studies, Senator Crawford decided to move forward in Nebraska. “We had a chance to find out what happened in the other states, and a chance to talk to the epilepsy specialist in our state, and really do the hard work of figuring out the best way to move forward.” Crawford says. Meanwhile, continued efforts to bring a high CBD strain of medical marijuana to Georgia garnered bipartisan support during the most recent legislative session. Hurdles remain but lawmakers continue to be optimistic as they prepare to make another attempt at passing the legislation next year. The bill is being drafted after a series of committee hearings and included testimony from leaders within the law enforcement and medical communities who raised concerns about the use of medical cannabis even under narrow circumstances. Meanwhile, progress is being made in terms of bringing clinical trials to Georgia, but advocates warn that will not be enough to help all those who see the drug as their best hope to manage debilitating conditions. “I don’t think any of us are opposed to finding out how effective it is or how it works, but let’s have compassionate use with it as well,” said Bob Kutchback, whose young granddaughter suffers from a rare disorder that causes severe seizures. Rep. Allen Peake (R-Macon) took the initiative to introduce a bill earlier this year to allow the use of cannabidiol but it ultimately failed amid some last-minute maneuvering on unrelated legislation. Peake said recently he expects to have a draft bill soon and it will allow for a limited number of businesses to obtain a state license to grow and process marijuana for the sole purpose of providing the cannabis oil under a system in which people of all ages with certain medical conditions would be able to obtain it under the supervision of a doctor. When lawmakers were unable to pass legislation, Gov. 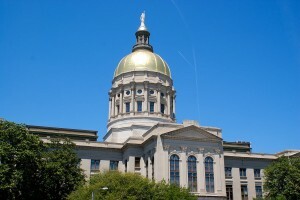 Nathan Deal brokered a partnership between Georgia Regents University and a British company that allows for the state to have its own clinical trial. University officials say they have some of the federal approvals needed to move forward and hope to begin accepting patients soon. Officials said the cost of the trial could reach $8 million, which would need to be allocated by lawmakers next year with the governor’s approval. Shannon Cloud, whose daughter suffers from severe seizures, said she wasn’t sure her daughter would even qualify for the trials because of restrictions on the number of children, age and frequency of seizures. “We hope they decide to open it up to more people than that because the clinical trials take such a long time and it would be really unfortunate for people, not just kids but adults too who are suffering, to have to wait for a trial when we know it works,” Cloud said. As these legislative battles continue in Nebraska and Georgia, a new study published in Molecular Cancer Therapeutics has been released showing that cannabinoids could play a role in treating one of the most aggressive brain cancers in adults. Recent studies have shown that some cannabinoids have potent anti-cancer action. For example, both THC and CBD have been shown in a number of laboratory studies to effectively induce cell death in tumor cells by modifying the faulty signaling pathways inside these cells. Depending on the cell type, this can disrupt tumor growth or start to kill it. The psycho-activity associated with some cannabinoids, principally THC (which gives people a cannabis high), is also mediated via the same receptors. Because these receptors are found in the highest abundances in brain cells, it follows that brain tumors also rich in these receptors may respond best to cannabinoids. Wai Lu continued this investigation of the anti-cancer effects of CBD in glioma cells. High-grade glioma is an aggressive cancer, with very low long-term survival rates. Statistics show that just over a third (36%) of adult patients in the UK with glioma live for at least a year, while the five-year survival rate is 10%. “We first had to perform lab tests on cells to optimize the doses of the cannabinoids, and showed that CBD and THC combined favorably. The results of this study are another promising addition to the arsenal of those on the front lines of the fight for fair access to CBD. As studies continue to be released highlighting the effectiveness of CBD to treat a variety of life threatening illnesses, lawmakers across the country may finally wake up to the reality that their constituents are needlessly suffering.